Berly did an amazing job with my wedding cake. It was more than expected, she really exceeded my expectations. Everyone loved the cake, it wasn’t too sweet nor bland...it was just right. I wanted a really tall cake and she made that possible. Thanks again for your service Berly. Hello Vena, thank you for trusting me with your tall cake. It was a pleasure serving you, your family and friends. All the best! Both Beautiful and Delicious. Not an easy combination for a large wedding cake. Beryl knows what she's doing. She is heartfelt and sincere and makes sure your day is special. The wedding cake was beautiful. There was nothing left. Guests were looking for seconds. Thank you Beryl for the beautiful cake. My husband and I want to send a huge THANK YOU your way! Your cakes were perfect! 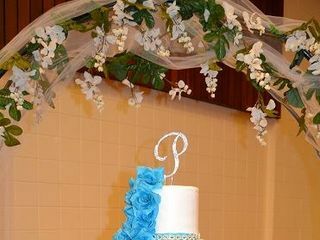 The tiered cake especially looked beautiful on our table and was even better than we had envisioned it! We got so many compliments on how delicious our cake was. So many guests have asked us who did our cake, because it was the BEST - we give them your name so hopefully you get many referrals from us! My husband and I made sure we got a "to go" with every flavor so we got to have some of each, all were fantastic! We are so pleased you were able to be a part of our day and will be sure to give out your name to all we know! The coconut hmmm yummy, pink champagne, oh did I tell you how soft and smooth the strawberry flavor was. 7 tiers different flavors? Who can beat that. You are the best. We love love love Beryl' s Cake. Thank you Jazmine. It was nice meeting you and working with you. Looking forward to making you some yummy treats. 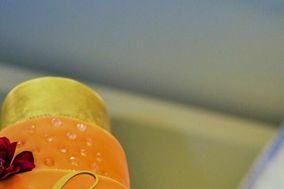 Thanks again for choosing Beryls Cakes. Thank you so very much Abby! I am so happy that you enjoyed your wedding cake! 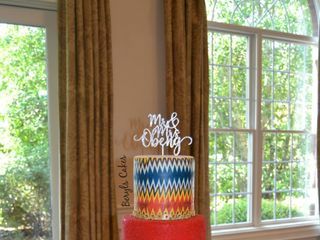 I highly recommend hiring Beryl's cake for your upcoming wedding or special event. She truly has a gift in the art of cake baking. Not only did she work with us on our vision, but she went above and beyond to make the cake look even better than what we had shown her during our first meeting. Beryl's Cakes are moist with the perfect icing to bring all the flavors together. 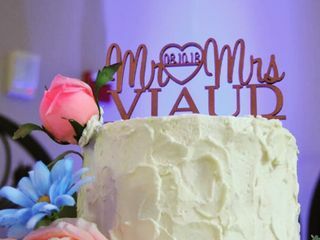 My husband and I were pleasantly surprised by the cake when we arrived at the venue and we would gladly work with her again in the future. Thank you SO MUCH Beryl for this beautiful and delicious cake. You're the best! Beryl Is amazing! 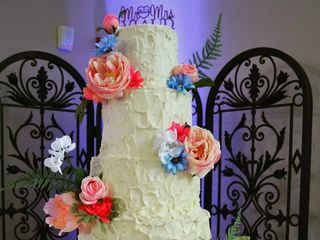 I received so many compliments on not only how beautiful the cake was at my wedding but also on how delicious it was! everything was perfectly sweet! She was so helpful in the design process and I loved that having different flavors didn't add to the cost!! She is incredibly sweet and super easy to work with and we knew almost immediately that we'd be using her. Don't wait, book her now! It'll be the best decision you make! Beryl was an excellent baker that we enjoyed working with. Our cake for the rehearsal dinner and the wedding night was delicious!! When we went for our tasting, she gave us cupcakes to bring home with us. Then she has offered to give us a complimentary top tier for our one year anniversary. The wedding cake was absolutely beautiful and I am so glad we chose Beryl to be our baker! Best cake I’ve ever had in my life, hands down! Had a bunch of compliments at the wedding. If I had to do it over again I would choose Beryl’s again. She’s affordable and AMAZING! Working with Beryl was amazing and I would hire her again for any cake/cupcake needs!! She is in constant contact and is very responsive. Her cupcakes and cake were beautiful and delicious and matched our wedding perfectly. Definitely recommend!!! Hello Mrs. Lane, It was a pleasure working with you and I'm looking forward to making more cakes for you in the near future. Thanks for the kind review. Beryl is amazing and her cakes are out of this world!! Satisfaction is always guaranteed with Beryl!! Beryls cakes was so easy to work with. She was really patient and made sure I was comfortable and satisfied with everything concerning my wedding cake. I didn't have to worry about anything concerning the cake the day of the wedding. She brought in, set it up and took care of the stand she graciously brought for us to use. And the cake tasted heavenly!! Beryl's Cakes was the best. I really don't like cakes, but I was able to finish two huge slices of cake on my wedding day. The cake was moist and delicious. It melted right in your mouth. Everybody talked about the cake. Not only did the cake look good, but tasted very good. I'm definitely a repeat customer. You can't go wrong with Beryl's Cakes. Now I know there are 2 kinds of cakes out there, Beryl's Cakes and the others. Thanks Beryl's Cakes. YOUR ROCK!!!! 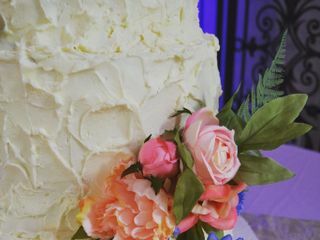 Beryl cakes made our wedding cake and it was everything we wanted. My wife and I were very much pleased with our wedding cake from Beryl"s Cakes .We wanted a wedding cake,that was simple,yet very elegant. All we did was to explain to Beryl Cakes how we envisioned the cake to be and they were able to translate it perfectly into reality .It is not very common for guests,to remember how tasteful a wedding cake was,but some of our guests remind us of their memories of it,in addition to the fun they had at our ceremony. 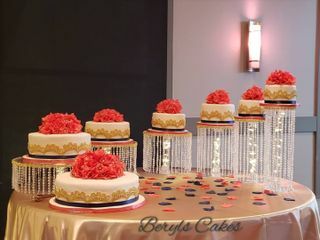 I recommended Beryl Cakes to everyone, because they are exceptionally good,very professional and flexible. Above all you get value for your money,when you employ their services. Beryl's cakes is amazing. First of all the cakes taste great. I have a lot of non-cake eaters in my family and even they were asking for seconds and thirds. There is something about the favors thats just perfect. I am nigerian so Beryl's cake also made the cake for my traditional nigerian wedding, which was beautiful. Both my cakes turned out the exact way I wanted. It's not costly. She provided the cake stand, knife and servers for a security deposit of $50. Which i got back the very next day when the items were returned to her. Very polite and went beyond and over to provide amazing service. The cake was beautiful and amazing. We showed her a picture of what we wanted and it turned out better than the picture. The cake was moist and melted in your mouth. The fondant was also very good. Most fondant on cakes are nasty but this one taste just like the icing flavor and not too sweet. The cake arrived on time. Beryl was amazing. Our cake tasted way better than the sample cakes we tried with her. She made me both a 3 tired grooms cake complete with gum paste Unc rameses and a 4 tired wedding cake with gold foil fondant. It was above and beyond our expectations! Delicious, delicious, delicious! We decided to get cake last minute for our wedding and Beryl's was very flexible! She had me at the taste testing! The presentation of her cakes was delightful, and the taste, even better. 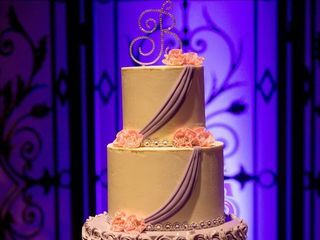 For our wedding we decided to go with 3 large sheet cakes: yellow with butter cream, chocolate with mocha cream, and cocoanut with lemon cream (my favorite). We received several complements from our guests! Thank you Beryl's for making our wedding just a little more sweet! I LOVED the whole experience and would recommend any and everyone to enjoy the same with your special day as well! There are not enough kind words to use to describe Beryl. She is so talented, accommodating and sweet. She did exactly what I wanted and more. She made the perfect grooms cake and the most beautiful wedding cake. My husband is a huge Redskins fan and the grooms cake made his mouth drop. As soon as he walked into the hall he ran to the cake and was so excited. As a little girl you dream about your wedding cake and imagine how beautiful you want it to be. My wedding cake was more than I could ever imagine. It was absolutely perfect, exactly what I wanted, the peacock feathers and colors were beautiful. Beryl let us have various flavors and even provided a matching cake stand for both cakes. Through all the craziness the day before my wedding my cake topper broke and I forgot to tell Beryl. On my wedding day, a couple hours before the reception and delivery of the cake I texted Beryl and told her the topper broke. Before I knew it she went and bought me a new up and set up the cake table so beautifully. Beryl is so genuine and so great at what she does and is also so reasonably priced. I highly recommend her and I know who to call if I ever need a cake. Thank you Beryl for making my dreams come true with the grooms cake and the wedding cake. Beryl was just amazing! She is very sweet, and she knows what she's doing. The cake was just delicious, everyone absolutely loved the cake. We were able to pick different flavors and pick the design of our choice and the price wasn't over the top like other companies.